How long have you been freediving for? I have been free diving since I was a kid only we didn't call it free diving then it was just who could swim the deepest or hold their breath the longest. I have always loved being in the water and was snorkelling and scuba diving before i discovered real free diving. I guess I have been training properly for about 2 years and I competed in my first competition in March this year. How did you start freediving? 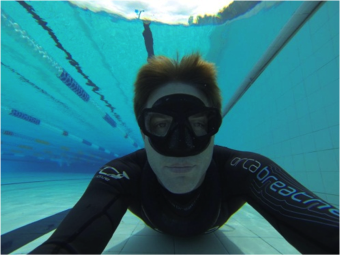 I started free diving and training properly after I did an Apnea Australia Stage A Freediving course. I was working as a dive instructor at the time for a local dive shop and had been nagging at my boss for a few months to introduce me to a free diving instructor that he knew. I was working at the ODEX dive show promoting the dive shop and got introduced to Bjorn Nielsen the instructor, after chatting with him I booked the course straight away and from the time I did the first course I have only scuba dived again once or twice. As soon as I tried diving on the line I was hooked. What do you love about freediving? what don't I love about freediving? I was thinking just today, the cool thing about free diving is that it lets you be a little kid again. You have no worries or stress; you are totally in your body and in the moment. You can just play in the water and experience the way it feels and be weightless. When the water is no longer a hostile foreign environment but somewhere that it feels better to be, that's a pretty cool feeling. How do you train for a competition? I find it hard to push myself and train hard in the pool, depth is my thing for a depth competition there is an extra consideration of your body needing to adapt to depth and the pressure so on top of the usual fitness training athletes will arrive a week or sometimes a month before a competition to start gradually working their way back down to their competition depth dives. I like the idea that training should still be fun and gradual progress is much better than over training to make short term goals.